Explore the life and legacy of playwright August Wilson — the man some call America’s Shakespeare — from his roots as an activist and poet to his indelible mark on Broadway. 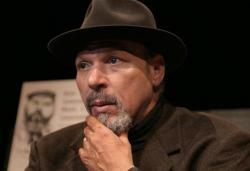 August Wilson: The Ground on Which I Stand, an American Masters presentation, airs Saturday, February 16, 2019 at 4 p.m. on WXXI -TV in honor of Black History Month. Filmed in the cities where Wilson made his mark, the documentary begins in Pittsburgh’s Hill District, where the future playwright, a brainy, bi-racial child raised in poverty, dropped out of high school because of bullying and prejudice. Self-educated in the city’s public library and streets, Wilson was influenced by the rising black consciousness of the 1960s and became an activist young poet. The film follows his transition to a successful playwriting career, from the founding of the Black Horizon Theater (Pittsburgh) and his early work at the Penumbra Theatre (St. Paul, Minn.), to his big break at the Eugene O’Neill Theater Center’s National Playwrights Conference (Waterford, Conn.). There he began his life-changing collaboration with mentor-director Lloyd Richards, leading to nine original Broadway productions.